Nebe Kremencova Music Bar is a popular venue on the Prague nightlife scene for local Czechs. But the International crowd should not hesitate to try it out either. Nebe (which means Sky in Czech) is set in restored medieval cellars, fitted with modern aircon and extractor units to give it a clean, airy and smoke free feel. It is furnished in a contemporary style, with walnut coloured tables and a gleaming backlit bar. With seating all around the edges, take a pew and soak up the atmosphere over a well mixed cocktail - there are over one hundred to choose from, including their speciality: "bucket cocktails" for eight people. There is a small dance area at the back of the bar, which people gravitate towards as the night progresses. Although a brisk five minutes walk from the central Prague nightlife zone, Nebe is a decent bar to make the effort to visit. 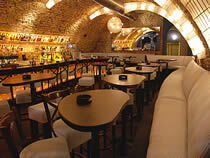 You can also combine it with a visit to nearby Solidni Jistota Bar & Club.